Kurata Kenta (Aiba Masaki) is a coward who avoids confrontation and disputes. Due to his upbringing he never bothers other people or does he trouble people, and uses preferably the sentence “I’m sorry” in any given circumstance. His father is the same way, and his mother is a happy person who never stops smiling. The only one in the family with a serious personality is the daughter, who is the complete opposite of everyone else. The family is happy and loving family, until one day Kenta finds his courage and tells off a man who bothers people at the train platform. Here he also meets Kandori Asuka (Sawariji Erika) a woman that always speaks her mind without holding back. After the situation the man runs off in embarrassment - but when Kenta takes the bus home that very man appears in the same bus. Creeped out Kenta gets out of the bus only to be followed by the man and it escalates with the man running after Kenta. Kenta runs around the neighborhood, and manages to lose him. The next morning though the flowerbeds in front of their house are ripped out. Unsure whether or not it is that man, Kenta wants to figure out who he is, and by pure luck meets Asuka again, who introduces herself as a journalist willing to help finding out the stalker. But as it turns out more and more things start to happen to the family, continuously bothering them. Who can it be, and why the Kurata family? My reason for watching this was mainly Aiba so I did not really read the summary of the plot. But I think that did kind of the good part here, not know what to expect. The drama is a mellow family story with a psychological twist to it, as it is very disturbing to know that due to a little confrontation you can become a victim of severe stalking and what I call ‘chain-stalking’. And to be honest, even though it isn’t all horror, it made my mouth dry quite a few times. Just the thought of ‘what-if-it-had-happened-to-me’ made me shiver. As I said: dirsturbing. As a general it doesn’t isn’r scary, and the family is so adorable and fun to watch, so you don’t get that bored, but to be honest it is a bit too ‘chain-stalkerish’… you’ll get what I mean when/if you see it. And I wasn’t all that excited to find out the ending. Aiba is great as always, and to be honest everyone was good at acting, even Sawariji whom I never really liked before. 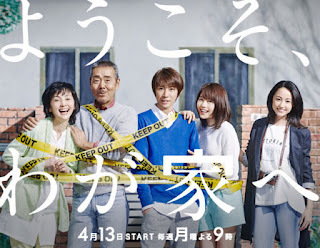 All in all: a good and interesting family drama with a hint of suspense.